Line drawing of male, by Martha B Lackey. Fig. 25 from Alexander, Pace, and Otte 1972. Range: Eastern and southwestern U.S. Males have two songs, the most distinctive is a rhythmic, even tic, tic, tic, tic, song that goes on for approximately 20 clicks. Alexander, R.D, Pace, A.E, & Otte, D. 1972. The singing insects of Michigan. Great Lakes Entomologist, 5: 33-69. Blatchley, W.S. 1920. Orthoptera of northeastern America. Nature Publishing Co., Indianapolis. 784 pp. Bland, R. 2003. Orthoptera of Michigan. Michigan State University Extension, East Lansing. 220 pp. Elliott, L. & W. Hershberger. 2007. The Songs of Insects. Houghton Mifflin, Boston. 228 pp. ; sonagrams, color photographs. Griffiths, J.T. 1952. 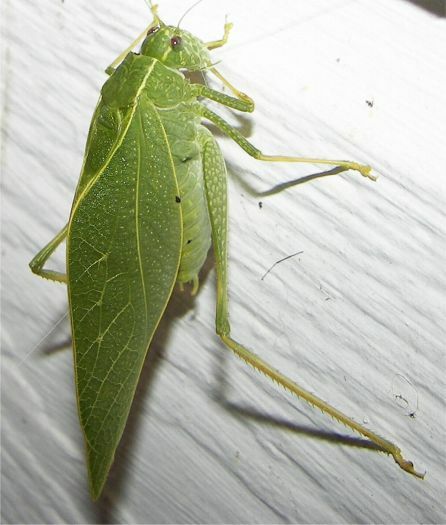 Some biological notes on katydids in Florida citrus groves. Florida Entomologist, 35: 134-138.